2CAudio - Breeze | Simple. Light. Pristine. Introducing Breeze 2: the first member of the next generation of our award-winning reverb family. We believe it is one of our best efforts to date! Not only does it sound absolutely sublime, but it is also now one of the most efficient reverbs on the market. It's more than twice as light, twice as pristine, simpler, prettier, and vastly more powerful. It's simply better. But don't take our word for it: just listen. Please see the Breeze 2.1 Release Notes for additional details. Almost everything. Our existing algorithms were rebuilt completely from the ground up. Of course we kept the best parts of our original design, but we effectively rethought everything. We rebuilt Breeze using new techniques learned from the past 7 years of experience and countless hours of math and science RnD. Any techniques that remain from 1.0 have been vastly improved. Many new techniques that are completely unique to Breeze 2.0 have been added. Essentially the DSP core that make our reverbs sound as good as they do has been rewritten and taken to the next level. 15 seconds of listening to the demo will undeniably confirm this. At the same time we employed new optimization knowledge learned working on our innovative product Kaleidoscope and Breeze 2 has now become one of the most efficient reverbs on the market! Everything that made Breeze 1.0 so widely loved, including access to its original sound, the price, and most importantly its simplicity. Breeze remains true to its own product identity, and everything said on the Breeze 1 tab above still applies to Breeze 2. The general layout and number of visible controls remains the same. Any complexity that was added to increase versatility for advanced users is hidden from the casual user on more advanced detail pages. Filter editing from the main page has even become much easier while at the same time being more powerful! This was an explicit mandate: Breeze must remain simple. Breeze is not B2 or Aether, even if it actually may surpass them in some applications at this point. Breeze must be simple. Simple. Light. Pristine. Happily Breeze 2.0 is all of these things and much more. It is truly the state of our art, and rather epic start to the next generation of our reverbs. Presets are a great starting point, and potentially all you need; however sometimes it's fun to get your hands a little dirty and tweak things a bit to customize your sound. Hidden behind its simple and intutive GUI, Breeze 2 offers quite a surprising degree of versatility and more adventurous users can acheive quite a diverse range of custom presets by exploring its details or using the innovative Algorithm Randomize button, which can instantly generate literally infinite variations of every possible preset! Need 1,000 Real-Time instances? No problem... HPC for everyone! If there was any common criticism about any of our reverbs, it would be that some of them can use a lot of CPU-resources. This is really the only reoccurring criticism we ever encounter, and generally it applies to Aether and B2 where we offer some very extreme things; however, as we started the next generation of our reverb development we decided to make this our number one priority. Our first goal for Breeze 2 was simple: make it at least twice as fast. For years we considered this impossible as our code was already highly optimized and already hand-written as vectorized SSE/AVX assembly. We tried a few years ago in fact and failed. We couldn't see a way to increase efficiency while remaining uncompromising on the quality we are known for; we didn't want to make the various compromises our competition had done because they all had negative consequences. We were stuck at an impasse. Then while deep in the RnD trenches for our Kaleidoscope product, we started to have some realizations of how to get the speedups we were after. We built some prototypes of some new ideas and had very promising results. Then we had a few eureka moments, and we started to see 150%, 200%, 300% and in some cases 400% and 500% increases in efficiency! Breeze 2 is now so efficient that it is easily possible to run over one thousand instances on the latest desktops and workstations such as Apple's new iMac Pro. Running a separate instance for every performer in an entire 100-person orchestra to achieve new levels of realism for example, is now quite literally a Breeze on modern CPUs. Breeze 2 is the first pro audio software of any kind to be optimized for Intel's new AVX512 instruction set and performance is simply staggering on CPUs that support it. Performance gains on recent laptops and older machines is equally impressive. At its lowest CPU-usage settings, Breeze 2 beats literally everything we have compared it to when measuring render times, including algorithms that are over 30 years old and are orders of magnitude less complex than Breeze. Even at its most CPU-intensive settings Breeze 2 still beats all of the modern competition when we look at algorithms of even remotely similar complexity and realism. Furthermore, Breeze 2 uses full 64-bit double precision end-to-end for all internal DSP calculations, whereas almost all of the competition uses 32-bit math and other compromises which result in noise and artifacts particularly when using modulation. Relative to its exteme fidelity, Breeze is insanely efficient and simply untouchable in terms of raw speed. In summary, not only do we have arguably the best sounding algorithms on the market, but we are also now one of the fastest by large margins. Ultra low CPU usage as explained below is great, but there is one thing even better: zero CPU usage! Beginning with Precedence and Breeze 2.1, we have now introduced an intelligent Suspend-On-Silence feature in our products. If the plug-ins are not receiving any input signal, they will automatically disable processing, and enter an approximately zero CPU usage state! This is huge news for composers who use massive scoring templates and like to auto-load hundreds of instances. Maximum CPU usage will only be reached in such cases when all tracks in the project are active at the same time, which almost never happens in large sessions. Sparse arrangements can save orders of magnitude in CPU-resources, which in turn leads to more creative freedom and less annoyances such as heat and fan noise generated by powerful computers in the studio. Furthermore, if playback is stopped for a coffee break, lunch break, or overnight, processing is automatically suspended, potentially saving you significant money on your electric bill. In other words, we automatically turn the lights off for you, helping to save the planet in the process. We think that is pretty cool. Life is full of color. We find it everywhere: in nature, in art, in culture, in sports, and even in political offices these days. Why should software GUIs be any different? With the release of Precedence and Breeze 2.1 we are introducing our new Chameleon Color user preference system for all our products. This system allows extreme user control over the hue, saturation, brightness, contrast, vibrance, spectral intensity, color harmony, and other more macro design choices in our GUIs. Huge variations in GUI appearance are now possible, from subtle, elegant and professional refinement, to boisterous frisky frolics that inspire creativity and scream "be different". Approximately 150 different Color Preference Presets are supplied pre-made as well. Of course a huge number of GUI sizes are available as well for further customization. Have it your way. Life's a box of crayons. Breeze 2.1 is available for AU, VST, and AAX hosts under Mac OSX.8 or higher including Mojave. Precedence is 64-bit only on OSX. Breeze 2.1 is available for VST and AAX hosts under Windows 8 and Windows 10. Both 64-bit and 32-bit versions are provided for all formats. The 64-bit version of Precedence also works in 64-bit hosts on Windows 7 64-bit. Windows 10 64-bit is recomended and is the focus of our ongoing development efforts. Breeze 2 was the first pro-audio software product of any kind to offer AVX-512 optimization and performance on machines that support it, such as Apple's iMac Pro, and systems built around Intel's Skylake-X, Xeon-W, or Xeon-SP CPUs is simply incredible. Breeze 2.1's proceedureal GUI system requires Open-GL support. “ 2CAudio has hit another home run with this excellent workhorse reverb. Pros: Simple interface. Good filtering options. Excellent presets and sound. Optimised CPU usage. Automatic level matching. Informative manual. Sometimes less is more. Sometimes it is best to just K.I.S.S. Breeze is a Breeze to use! Literally. It offers an innovative, minimalist GUI design that focuses on instantly communicating the most important preset information to the user, and summarizing this information graphically in two aesthetically pleasing and intuitive graphical displays. Macro controls combine many complex, behind-the-scenes DSP parameters into a beautifully compact set of nine knobs and four sliders. Parameter ranges and scaling are optimized to make it almost impossible to create a bad sounding preset. Signal gain has been meticulously balanced to the point of making the need to adjust the gain control almost obsolete, leaving users with one less thing to worry about and free to focus on more important details. It is quite simply a Breeze to find the perfect settings for any given source material. Not only is Breeze light on your brain, but it is also light on your wallet and light on your CPU. Even in today's challenging climate, economy is not always a bad word! Breeze's modest price is unlikely to cause budget deficits or exacerbate the risks of fractional reserve banking. No credit crunches are to be found here. At $124.95 for new customers, and $99.95 for customers who already have one of our other reverb products, Breeze even scores quite high in spouse approval ratings. When it comes to CPU usage, Breeze is the ideal reverb choice for laptop use, and live performance. Breeze has been highly optimized to require less power as compared to Aether, B2, and other products in the market. Breeze is furthermore designed to intelligently use only as much CPU power as is absolutely required for a given preset, and automatically disables various parts of the algorithm when not required to conserve energy. It also offers an additional "Hi-Lo" switch to further push efficiency into even deeper shades of Green. When used with current top-of-the-line studio workstations, over 500 instances of the plug-in can be run in real-time depending on settings. Simplicity and economy are great, but they don't mean much if the sound quality suffers to achieve these goals. Not to worry, because while Breeze may be an angel in terms of its ease of use and cost, it's still a demon where it counts. As a direct descendant of Aether, Breeze has enough mojo to go around. It is used side by side Aether by many industry-leading film, television, and game industry composers who use a huge number of Breeze instances as track inserts to give each instrument its own position in virtual space, while reserving one or two Aether instances for use on auxiliary busses to glue the mix together cohesively. This can be a very powerful technique and should not be underestimated. It is equally adored by world-class performers who are simply looking for a great sense of space to augment their performance and do not care specifically whether it is a hall emulation versus a chamber emulation. In these contexts psychoacoustic cues such as envelopment, spatial impression, stereo positioning, and frequency decay are all that matters, and Breeze delivers them in spades. We invite you to take a listen for yourself; you won't be disappointed. Breeze 2.0 is available for VST and AAX hosts under Windows 8 and Windows 10. Both 64-bit and 32-bit versions are provided for all formats. 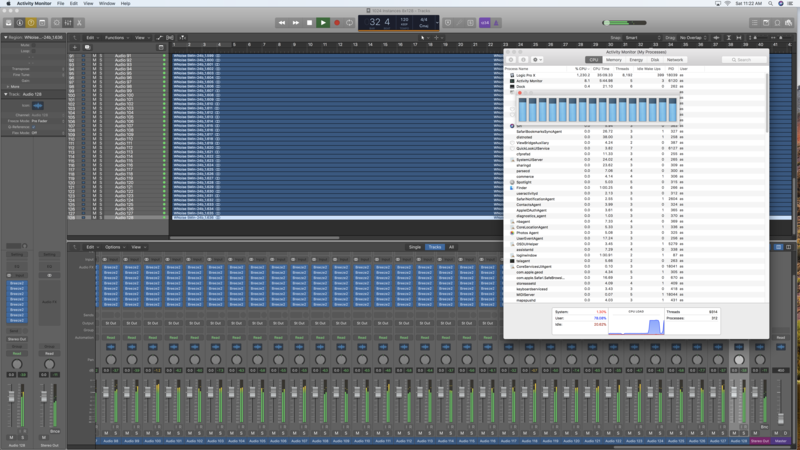 Breeze is available for AU, VST, and AAX hosts under Mac OSX.7 or higher. Breeze 2.0 is 64-bit only on OSX. High Sierra Compatibility is forthcoming. A CPU with AVX Instructions is required for Breeze 2.0 during the Pre-Release. The first CPUs with AVX instructions were the Intel Sandy-Bridge generation orriginally released in 2011. Breeze 2.0 Pre-Release is optimized for AVX, and AVX2. The final release in January will also be offered with blazing-fast AVX512 support as well, supporting bleeding edge machines such as Apple's iMacPro, making it one of, if not the, first commerical audio plugin to support AVX512. We are looking into legacy support for older CPUs that only have SSE support. “ WHOA. As a film composer, I've been on the lookout for a "holy grail" reverb plugin for some time. The main criteria is sound, obviously, but CPU usage is important too (my big template uses around 12 buses with various verbs). There have been some good ones, and the best one I've heard is the Lex PCM Bundle, by a long shot (for the sound I'm after, anyway). However, $1500 is a lot for almost any budget these days. Still, it's the only thing I've heard to this point that gives me that sound - until today.